Darnell Dockett is the top DT so far with 1.25 +WPA. His biggest play was a forced fumble returned for a TD in the Cardinals’ upset of the Saints. Dockett has 31 total takles for a 1.44 TF, including 2 sacks and 6 for losses. Behind Dockett is Haloti Ngata, whose name is fun to type. Ngata has a +WPA of 0.91 so far, a TF of 1.86, 5 sacks, 1 pass defended, 9 QB hits, and 9 tackles for losses. LB Lawrence Timmons has been brutalizing offenses all season. He tops all LBs with a 1.95 +WPA. He has 2 interceptions and a forced fumble, plus 3 sacks, a 1.81 TF, 5 QB hits, and 8 tackles for losses. His biggest play isn’t one of his 3 turnovers or anything else spectacular. Late in the 4th quarter in the Steelers’ week 1 game against the Falcons, Timmons dropped RB Michael Turner for a 3 yard loss on a 1st and 10 on the Steelers’ 14. Why was this such a crucial play? It helped force the Falcons to kick a tying field goal rather than scoring a go-ahead TD. Paris Lenon of the Cardinals is second to Timmons with 1.43 +WPA. He has a 1.40 TF, 1 sack, 4 passes defended, 1 QB hit, a forced fumble and 2 interceptions. LaRon (don’t forget to capitalize the ‘R’) Landry ranks as the top S with 1.71 +WPA. 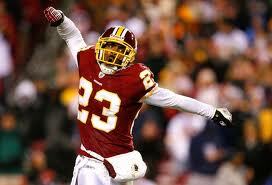 Landry is cleaning up the mess the rest of the Redskins are leaving behind, totalling 76 tackles for a 1.81 TF. Add 1 sack, 7 passes defended, 6 tackles for losses, 5 QB hits, a forced fumble and an interception, and you have one monster safety. The next closest S is Michael Griffin of the Titans, who’s a distant second with 1.16 +WPA. DeAngelo (don’t forget to capitalize the ‘A’) Hall is the top CB with a nice even +2.00 WPA. Nearly half of that is thanks to his 4-interception game against Jay Cutler and the Bears, but even without that game, he’d still rank 3rd among CBs. Hall has 63 tackles, which is not such a good thing for cornerbacks, but +WPA only measures tackles that are defensive ‘victories,’ He has 9 passes defended, 2 tackles for losses, 1 forced fumble, and 6 interceptions. He also had a fumble return for a TD on that silly play right before halftime against the Cowboys. The problem with Hall is that he appears to be a gambler. His Success Rate is low at 35%, suggesting his name is very often being called out in the play-by-play after successful pass completions. Still, his +WPA is so high, the gambles may be worth it. The next CB is a distant second. Charles Woodson has a 1.31 +WPA. Woodson and Hall have nearly identical +EPA numbers, meaning Hall's best plays have come in high leverage situations. Those are your WPA All Stars on Defense for the first half of 2010. "LeRon (don’t forget to capitalize the ‘R’) Landry ranks as the top S with 1.71 +WPA." Don't forget to spell his name correctly. "Don't forget to spell his name correctly." Foolow the device of Mr, Unanimous, Brain. Mr. Ngata's first name is Haloti not Hiloti. You should higher a etodir. Didnt you mama teach you to spel? Sorry. My dad never checked my homework when I was a kid.